KTMtwins.com KTM Motorcycle and Product News: Repairing your Akrapovic EVO Exhaust Cans! 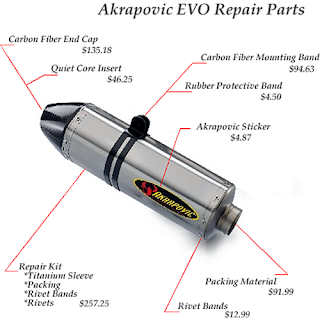 Repairing your Akrapovic EVO Exhaust Cans! Need to repair that $1300 Akrapovic EVO Exhaust after a slight get off? We have all been there. KTM and Akrapovic are there for you. Don't worry you don't have to buy another full exhaust system. You can either piece together each item that is damaged or you can purchase the Repair Kit which includes the Titanium Sleeve, Rivet Bands, Rivets and Packing. It your baby is scratched don't worry. With a little patience and a good rivet gun you can make her look good again. Contact me at "orders@ktmtwins.com" if you need these parts right away. If not keep looking for these to be available on our site in a week or so. King of the KTM 950 Super Enduros!